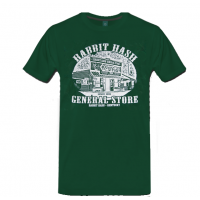 The town's name, "Rabbit Hash" is said to have originated during the flood of 1847 when the abundant local rabbit population was driven to higher ground and became a food staple in a special stew called "hash." 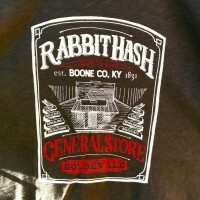 Little documented history of Rabbit Hash actually survives, primarily because devastating Ohio River floods in 1884, 1913 and 1937 deluged the little town and ruined many records. 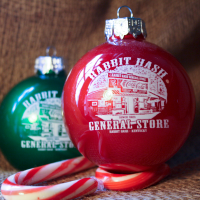 The Rabbit Hash General Store was completely submerged during the 1937 flood that crested at an unheard of 79.9 feet. There is still mud in the store's attic crawl space from the historic 1937 flood, and the only reason it has survived the river's often angry waters is that it is anchored securely to the ground by a series of iron rods which run through the entire structure. Much of the rest of Rabbit Hash was not so fortunate during the historic flood. Several residences, outbuildings, the creamery, a tobacco warehouse and the blacksmith shop were washed away in 1937.